A 4K resolution, as defined by Digital Cinema Initiatives, is 4096 x 2160 pixels (256:135, approximately a 1.9:1 aspect ratio). This standard is widely respected by the film industry along with all other DCI standards. Maybe you have downloaded some 4K video clips from YouTube and want to merge them into one single video file. Maybe you have recorded some 4K videos with your 4K camcorder and want to extract certain part. Or maybe your 4K video is too dark and needs to be brightened. Although 4K resolution videos bring you excellent visual experience, sometimes you still need a video editor to make some changes to the video. Meanwhile, not all video editors support 4K editing. Here we present you the best 4K Video Editor – Pavtube 4K Video Converter (both Mac and Windows are available). Pavtube Video Converter is considered as the most easy-to-use and effective 4K Video Converter and 4K Video Editor software by CNET, the world’s leader in tech product reviews. Pavtube Video Converter fully supports 4K video editing of 4K videos shot by camera, video downloaded from YouTube and more. The 4K video editor features all-in-one powerful, fun and easy home video editor to output high-quality videos. Fully support 4K video editing in HEVC, WebM, ProRes, XAVC, etc. Support editing footage from 4K cameras like a JVC GY-HMQ10, Canon EOS-1D C or Sony FDR-AX1. Easily edit videos in almost any format including AVI, WMV, MP4, DVD, VOB, 3GP, MOV, MKV, H.263/H.264/H.265 codecs, MXF, MTS, M2TS, etc. 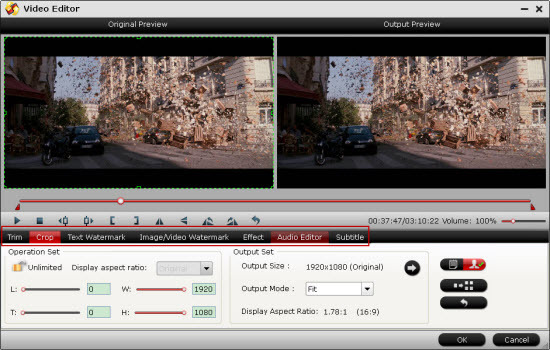 Powerful editing functions are available, such as trimming, cropping, splitting, merging, adding subtitles, attaching watermark, creating effects, etc. Capture your favorite moments with quick snapshots as you’re previewing the footage. Fully compatible with OS X 10.10 Yosemite, 10.9 Mavericks, 10.8 Mountain Lion, 10.7 Lion, and the earlier OS X.